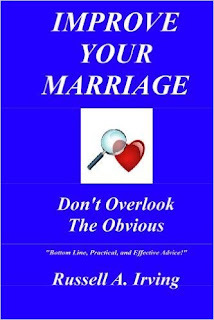 Improve Your Marriage: Don't Overlook the Obvious by Russell Irving is not your typical self-help book. The author doesn't present a radical new system to fix your relationship. He doesn't use special jargon or a trendy catch phrase. His book doesn't even have chapters. And that's the point. Irving's contention is that people tend to over-complicate and over-think their situation, when what they really need to do is take a clear look at what's in front of them and apply some common sense. With that in mind, he has put together a collection of observations, suggestions, truisms, and comments aimed at helping people get on the right track. As the author says in his introduction, some of this material may seem familiar, even trite. That's intentional. All too often, people ignore the obvious approach, even though it may be the best way to proceed. They are inclined to shrug off conventional wisdom, looking instead for some novel revelation to miraculously solve their problems. But much of the time, the real solution is obvious, overlooked because it seems too simple or because it requires effort. Irving presents several ideas on each page in a succinct format reminiscent of Twitter. Here are a few examples that caught my eye. Making love is not another household chore. Every time that they tell you what matters greatly to them and you dismiss it, you push them further away. Knowing that you are loved. Being shown that you are loved. These are two different matters. And each one is equally vital to a successful marriage. Renew your marriage vows by simply living them, daily. This is not a book that is meant to be read straight through all at once. Rather, it is a book one would expect to find nearby, on the nightstand perhaps, where it can be picked up and perused as a source of inspiration, a stimulus for conversation, and a call to action.